There are 2 things that you need to deal with when it comes to foot odor, and that is bacteria and sweat. It is not actually the sweat that makes your feet smell, but the bacteria that thrives in the moist environment it creates. Sweat is actually odorless, for the most part, except for the kind that comes from the glands in the armpit/genital area. There are proteins and amino acids in sweat from those glands (called the apocrine glands) that feed bacteria, giving it a particular unappealing smell. The bacteria on your feet give off a kind of gas as they eat, which is the source of your problems. If you can keep your feet dry, clean, and fight the bacteria, you won’t have to worry about letting them out to breathe in a room with other people around. That’s easier said than done though, and when you need a little help, these 5 foot soaks can make it simple for you kick the odor-causing culprits. Epsom salt neutralizes odor, and as a bonus, it also happens to be very soothing on aching feet. Dissolve ½ cup of Epsom salt in 8 cups of warm water and soak your feet for 30 minutes 1-2 times daily. Dry thoroughly afterwards. Sage has antibacterial, antiviral, and antifungal properties, and is also an astringent. Rosemary is antibacterial/antifungal, and is an astringent as well-which means that both help minimize the production of sweat from the sweat glands. Less sweat means a less ideal environment for bacteria to harbor in. Fill a foot basin with boiling water and add the herbs to it. Let it steep until it is cool enough to put your feet in, but still warm. Soak for 30 minutes 1-2 times daily. Baking soda has too many uses to list here, but when it comes to foot odor, it can be a true miracle worker. 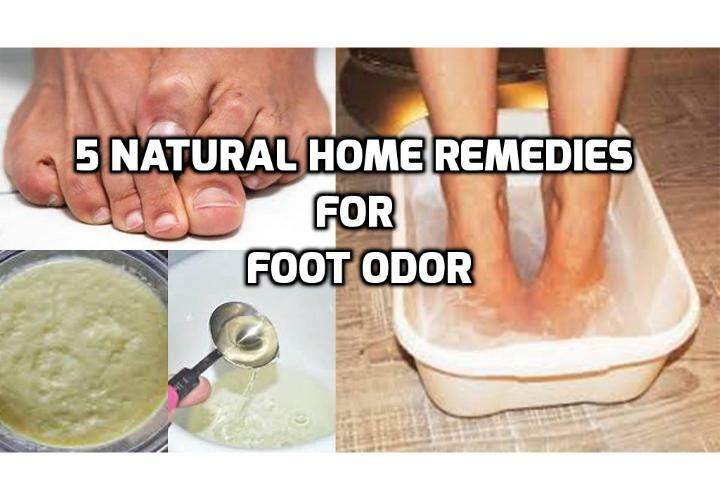 It naturally helps control odor, kill bacteria/fungus, and softens your feet to boot. Lemon is an astringent, which will help with excessive sweating causing food odor, plus it has a wonderful fresh scent. Place ¼ cup of baking soda in your foot basin, and then cover with approximately 8 cups of toasty (but not hot) warm water. Squeeze in the juice of one lemon, sink your feet in, and give it a little swish. Soak for 15-20 minutes or so, and then dry completely. Apple cider vinegar might not seem like the first thing you want to submerge your stinky feet in, but it actually does a nice job at getting rid of odor. Apple cider vinegar creates an acidic environment that bacteria have a hard time thriving in, reducing the count and subsequently the smell. Fill a foot basin with 5-8 cups of warm water and add ½ cup of white distilled or apple cider vinegar to it. Submerge your feet, swish the mixture around, and soak for 15 minutes twice a day. Dry completely when you’re finished-you can rinse them in cold water afterwards if you want. Common folklore often tells of soaking feet in black tea to remove foot odor- thought to be effective because of the high levels of tannins, or tannic acid, in the tea. The acid would create an unfriendly environment for bacteria, while it also possibly acted as an astringent (contracts body tissues therefore sweat glands.) It’s hard to find scientific evidence of this, but it might be worth a try as many people swear by it! Pour 4 cups of very hot or boiling water into your foot basin, and add 5 bags of black tea. Allow them to steep for 10 minutes, and then soak your feet for 20. Do this once a day, drying your feet thoroughly afterwards. Smelly feet are no fun for anyone (even our shoes suffer), but with a little bit of dedication, knowledge, and some awesome foot soaks on your side, you can triumph over this unpleasant condition. Looking for more ways to deep clean & pamper your feet? Our friend Marie from Humblebee & Me has created a great foot mask that will leave your feet feeling silky soft & extra clean. Mix together the dry ingredients. Add the vegetable glycerin and essential oils, and then gradually add the lemon juice to make a soft paste. Scrub into your feet and keep them somewhere easily washable (tub/sink/old bucket/outdoors) for about 10 minutes. Rinse off and moisturize. Sock up and enjoy your clean, soft feet! You can watch this Video HERE to learn about other ideas to treat smelly feet. -Sprinkle your shoes with baking soda, it is not only totally odor absorbing it helps keep feet dry and has kills off bacteria. -Wear open toed shoes when possible. -Avoid synthetic material in socks, which make it harder for feet to breathe. Out of the 2-3 million sweat glands on our bodies, ½ million are located on are feet. Scientists think this is because way back in the day when we walked everywhere. In those stone age days, we didn’t yet have shoes, our feet would get hot from walking on ground baked in the sun. The multitude of sweat glands allowed them to cool themselves off more effectively. Next PostNext How to Use Bread and Lemon to Get Rid of Corns and Calluses on Feet, Toes, Hands?